Before embarking on the procurement of your new Retail or Hospitality building project, it is important to ask yourself a series of very important questions. While the answers to some of these may seem obvious, they still serve as a useful checklist to help you gather the information you need prior to your ﬁrst meeting with the project architect. 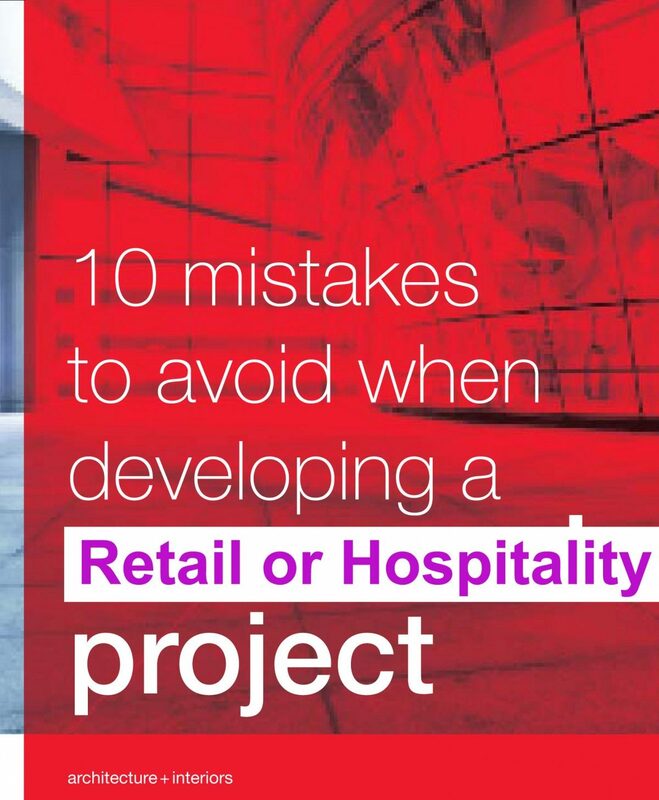 Here are some of the mistakes to avoid when commencing your Retail or Hospitality project, we hope you will find them useful. We have put 6 of the points on this blog post. If you want the full 10 points downloadable PDF presentation document or a hard copy posted just go to our website and fill in the details – don’t worry it will only take 2 minutes. Do you have experience in building a commercial project? If so, was it a good or bad experience? The issues you encounter when developing a commercial building differ from those involved in building a home for yourself. It is less about your personal preferences and more about making smart decisions that affect your organisation’s users, customers and the general public. These issues include functionality, economy, life safety, security, efﬁciency, ﬂexibility, and the environment. If you lack the speciﬁc experience, it might be useful to put together a building committee comprising the various key stakeholders in order to make important decisions about the building. It will be useful to appoint an architect who can guide you or the committee through the process. Do you own the property you are planning to develop? This may seem obvious, but having the Deed for the property is required for planning approval. Combined with the cadastral, these useful to put together a building committee comprising the various key stakeholders in order to make important decisions about the building. It will be useful to appoint an architect who can guide you or the committee through the process. Have you considered all the options for use on your property? While you may already have a plan in mind, you may be under utilising your properties’ potential. It may not be the right project for your site, or it may be overly ambitious. Expert advice is needed here to assist you with your ﬁnal development plan. How clear are you on exactly what you need, what it should cost, and how long it should take? to provide guidance on for your project. It is important to discuss with your architect what your needs and expectations are, not only to solicit his advice but also so that the design can be tested against these metrics as it is being developed. Design is not merely about what a project looks like, but more appropriately how efﬁciently it functions in meeting your needs as well as the needs of the building’s users. Do you have a budget, and are you conﬁdent that you have taken into account all cost elements? Building estimates move from very broad to more detailed and accurate as a design is developed and speciﬁed. A quantity surveyor with the correct guidance from an architect can develop a preliminary budget that will take into consideration all cost elements as well as provide the right amount of contingency. In summary, we recommend treating the questions above as a checklist before launching your project. If you would like to explore your needs and options early, before having to pay exorbitant design fees or worse yet, abortive construction costs, we invite you to contact us and allow us to prepare a Needs and Options Review for your project. If on the other hand, you know exactly what you want and are ready to proceed, call us to have a chat with one of our directors. It is not uncommon for people to know they want to do a building project, and have thought about it quite a bit – but just don’t know how best to start…! • A Timeline and Rough Order of Cost. It starts a strategy designed to precisely understand your requirements, and then give findings and recommendations, and a plan to move forward with a timeline and rough order of cost to assist your budget. Click on the link below to see our video that explains our process that can save you a lot of time and money and book a appointment.